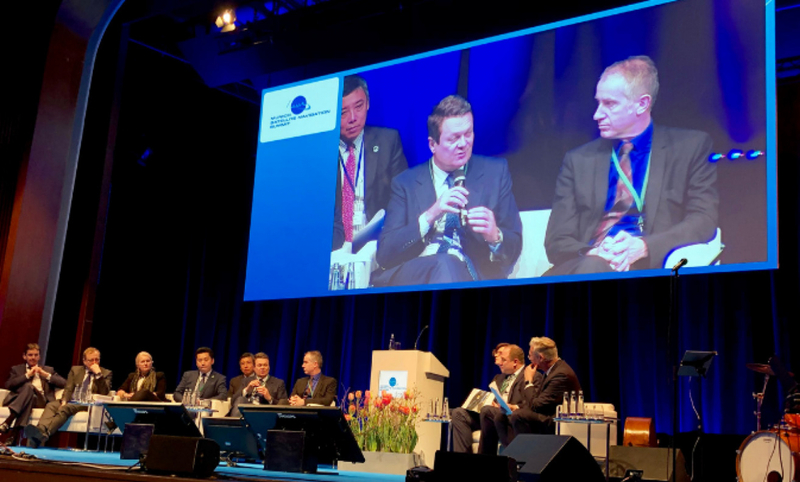 The opening plenary of the Munich Satellite Navigation Summit, on March 25, provided an opportunity for representatives from the GNSS industry in Europe and around the world to look back on what has been achieved in the year since the last summit, and to look to the future, where the challenge is to maintain current high levels of performance. The theme of this year’s summit was ‘Augment yourself with GNSS’ and the opening session looked at how innovations in GNSS, combined with international cooperation, are bringing benefits to society. While highlighting the critical value of Galileo accuracy, Dr Thomas Pany from the Institute of Space Technology and Space Applications at Bundeswehr University Munich said that all the global and regional satellite navigation systems would have to work closely together to reap the maximum innovative benefits of GNSS. Matthias Petschke, Director for the EU Satellite Navigation Programmes at the European Commission’s Directorate-General for the Internal Market, Industry, Entrepreneurship and SMEs, noted significant achievements over the past year, with more satellites launched and brought into operation, and important contracts signed, particularly for the ground segment. Petschke said, however, that these major achievements sometimes overshadow more ‘minor’ achievements that deserve to be put in the spotlight. Among these, he listed a waiver, in November 2018, from the U.S. Federal Communications Commission (FCC) for the use of Galileo signals in the U.S., and the publication of the E112 Delegated Regulation in December, requiring all smartphones sold in the EU to be ‘at least Galileo-enabled’ by March 2022, as two achievements that would promote the increased uptake of Galileo both in Europe and internationally..
“Galileo is vital for Europe’s critical infrastructure,” said Dr Pascale Ehrenfreund, Chair of the Executive Board of DLR, adding that as the system nears full operational capability there has been a shift in focus from infrastructure to service delivery to end users. In his address at the Summit, European GNSS Agency (GSA) Executive Director Carlo des Dorides also highlighted the major success in terms of service delivery and market uptake over the past 12 months, with almost 700 million Galileo users worldwide. “This is a remarkable result, which is being reinforced by the introduction to the market of dual frequency chipsets and the first smartphones exploiting this double frequency capability, bringing better accuracy and a more robust signal,” he said, reminding that the Galileo constellation has the highest number of dual-frequency satellites of any GNSS system. Des Dorides also referenced the recent launch of a Galileo-enabled chip with very low power consumption. “This is ideally suited for the IoT and we expect to see Galileo reaching very high uptake in this interesting domain also,” he said. Participants in the panel highlighted the excellent level of Galileo’s performance. “A report published by the Galileo Reference Centre, working closely with relevant entities at the level of Member States, shows that we are surpassing by far all of our commitments in terms of performance,” Petschke said. Des Dorides concurred, noting that Galileo’s performance had been excellent, with horizontal positioning accuracy well below 1.5 metres and per slot availability approaching 99.5%. “The challenge ahead is to maintain this level of excellence,” he said. EGNOS too has seen some major developments. In particular, Petschke noted the adoption last year of a performance-based navigation implementing rule, which makes compulsory the publication of EGNOS-based procedures in all EU airports before January 2024. “This is a huge step for the uptake of EGNOS in aviation,” he said. What’s more, in March 2019 the EGNOS Service Definition Document was updated with Safety of Life coverage extended to 72° N, providing full coverage in northern Scandinavia, and a new EGNOS transponder is set to be launched in May or June this year. “This will ensure continuity of EGNOS service provision over the next decade, at least,” Petschke said. Des Dorides noted that EGNOS was well deployed over Europe, with more than 300 airports or helipads served. “Other domains, such as the maritime and rail sectors, are also coming on-board,” he said. Summing up, des Dorides cited the State of the Union address by Jean-Claude Junker, in which the European Commission president highlighted that Galileo’s success is Europe’s success. “Galileo is finding its place as one of the most important achievements of the European Union,” des Dorides said.